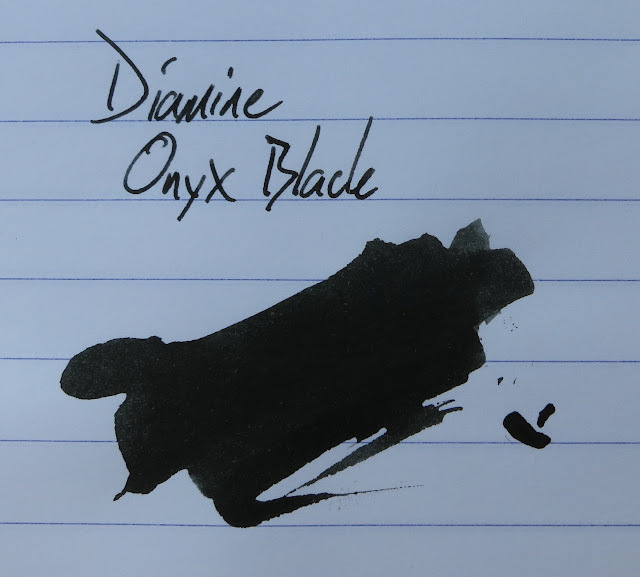 Diamine Onyx Black | Inkdependence! 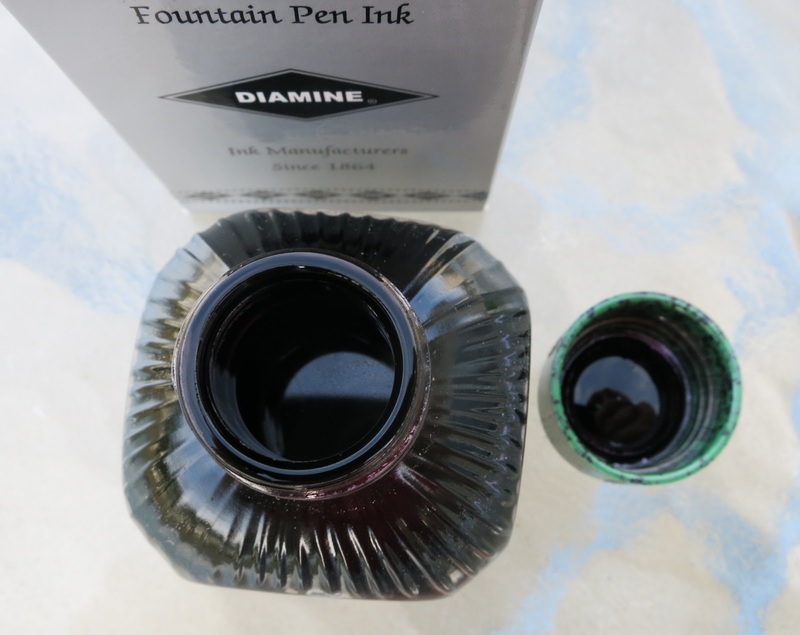 I can't believe that I haven't reviewed a Diamine ink since July of last year. Crazy, right? That's especially odd since I use their Salamander ink regularly, but I guess I haven't reviewed it yet. It's weird how things slip through the cracks, right? This is an ink that came to me through the Triangle Pen Club. We had an ink-sample sharing event a few months back, and someone brought this ink to the swap because they hated it and would rather give it away than keep it. I ended up taking it home, and I actually really like it. It's been in my Vac 700 ever since. 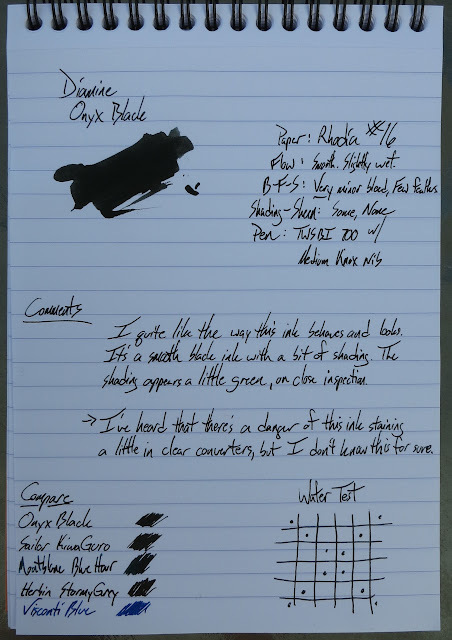 Onyx Black isn't the darkest black that I have, but that hint of shading is an interesting touch for a black ink. That little bit of shading is slightly on the green side, though the ink doesn't look green otherwise. 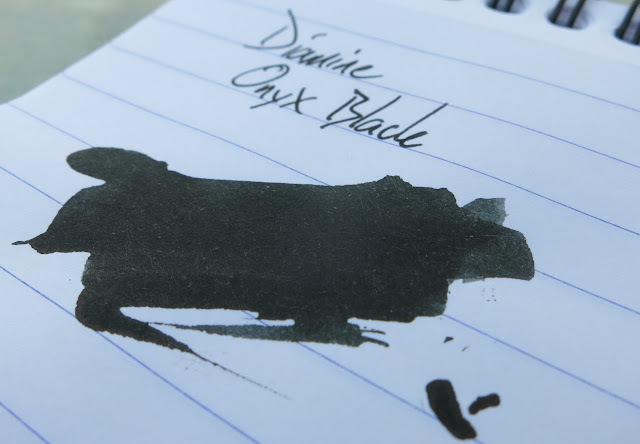 A black ink always needs something extra for me. It needs to be glossy, or matte, or have a sheen or something. Well, this one flows extra smoothly and it has a bit of shading, so it's one that I keep using. These pictures were taken outside in the shade, so there's no glare on them. The flow is really the standout on this ink, I think. Otherwise it's just a slightly shady black. Do you see a hint of green hiding in the middle just under the black band? I think I do, but it could be my eyes playing tricks on me. 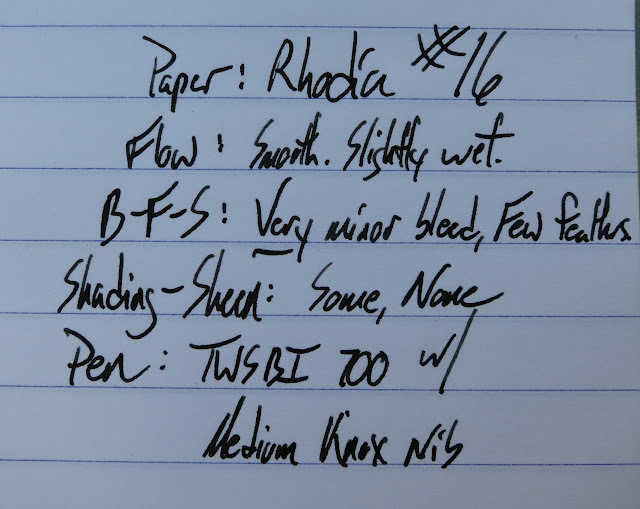 There are a couple of spots of bleed through on this 20lb paper, but it's nothing serious. I use this on all sorts of papers without issues. I think these are pretty cool bottles. They're a little shallow, and the neck is a little narrow, but it's not a big deal. They might be an issue eventually if you have a pen with a big nib and it can't be syringe-filled, though. So, I don't hate this one at all. 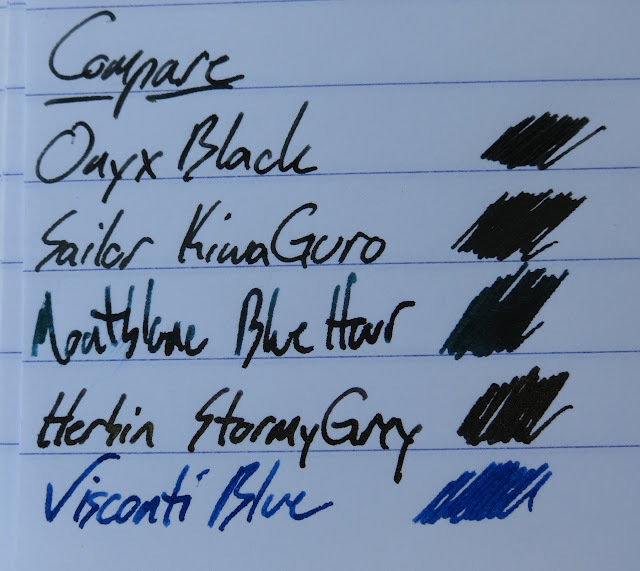 The water-resistance leaves everything to be desired, but the overall performance of this ink is stellar, and the color isn't boring (for a black). 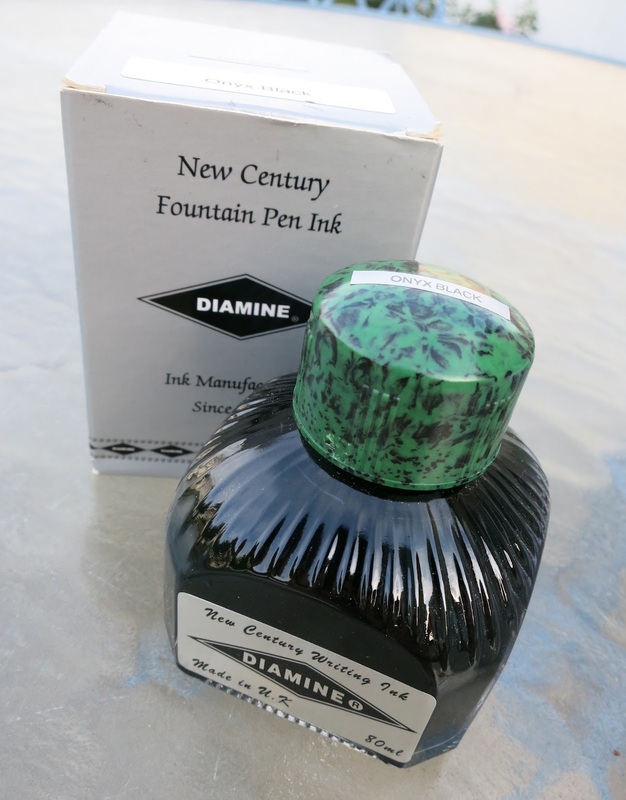 Check it out at your favorite Diamine seller. It runs about $15 for an 80ml bottle. Anderson Pens for bottles and samples.